I'm really confused by this. ArcMap will seeminly randomly decide to not allow snapping when editing. Sometimes its only for certain features, sometimes for only parts of the same feature (e.g. one end of a line but not the other, or not along a part of the line). Now its just flat out not letting me snap to anything (yes, snapping is turned on with all options on). Any hints on this one? I had the same issue, but a friend said that I should use classic snapping to help select the layers I wanted to snap to. The classic snapping was a simple work around to the issue. There are several steps I use. is easiest but don't necessarily try it second. copy the layer you need to edit, snap to and use for reference (as few as possible) to another document (for editing). make sure you don't have a definition query. I discovered that snapping won't work if the layer you're editing is in the Map Document more than once. What Brad said (especially make sure you're in data view - focus your data frame or edit in data view rather than layout). You can also tighten your snapping tolerance. Under the snapping drop down arrow, select "options". Change the number value shown in my printscreen below. Sometimes this works for me. I've seen instances where this seems to refresh my snapping capability. Usually, I just don't have my data frame focussed though. I just usually quit the map I am working on, and then restart it and it typically works again. What I have noticed is it has trouble when the mxd has too many layers or grouped layers. I have not checked but I wonder is the cache being to full or needing a purge may help. I had this "no snapping" problem, and the eternal blue circle pause when trying to edit. I had a huge file of contours on my map which were in a different projection than the map. I got the warning whenever I turned on editing, but I just ignored it. When I turned off the contours, suddenly snapping and editing worked fine! I was able to resolve this issue by doing the following: From the Editor Window --> Snapping --> Snapping Window and set the Snapping Environment. I was able to snap my vertices to the specified layer this way. An MXD that snapped yesterday might not snap today. That is why I sometimes revert to Classic Snapping. Mike's simple answer (for which he was chided) provided the best clue for my problem today. I didn't want to remove occurrences of my line data because the symbology varied. So, I tried moving the layer I was editing higher in the Table of Contents and classic snapping worked. 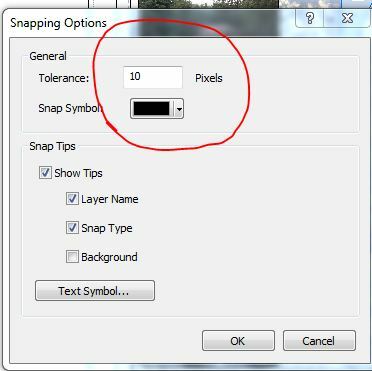 Try this to see if the layer you are snapping to is recognized by ArcMap. Use Classic Snapping. Then open the Snapping Window to see if that layer is listed. If not, move it higher in the TOC. I had an issue where the editor would not even select a certain point feature. I would have to select it with the "Select Feature" tool and then it could be moved but it would still not snap to the line feature. Not sure why this worked but I turned on a different point feature and was able to select it with the editor and could snap it. When I went back to the orginial feature I wanted to snap it worked. I had the same issue, and the only solution that I found was to only select the specific snap one at a time, for example, only activate "end point snap" and deactivate the others, I hope this works. Not the answer you're looking for? Browse other questions tagged arcgis-desktop arcgis-10.0 arcmap editing snapping or ask your own question. Automate end-snap of lines mid-way between nodes? Georeferencing in ArcMap very slow?